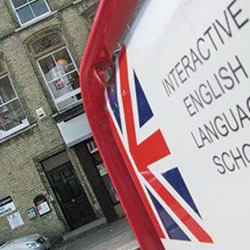 Interactive English Language School is a family run, British Council accredited school in the heart of Brighton and Hove, United Kingdom. Just 50 minutes away from London but based on the seaside, it makes a perfect location both for studies and holiday. Our school is located on the main bus route and very close to all local amenities. A 20 min walk will take you to the centre of Brighton and award winning beaches are just down the road. Our friendly English language school has about 120 students of all ages from 18 to 74, from over 30 different countries.